While siblings have different coats, they likely have the same parents. From the top of his furry head to the tip of his wagging tail, your puppy is a combination of both his mother's and father's genes. While your little one likely will resemble at least one of his parents, some pups develop physical characteristics that may seem surprising. All in all, a pup has 78 chromosomes in each of his body's cells, 39 of which come from mom and 39 from dad, according to Basenji University. Within these chromosomes, are thousands of genes. It's these genes, and the DNA that they contain, which determine your pup's appearance and temperament. When these genes combine together, different physical and behavioral traits from both parents are passed onto little Fido. This might lead you to think that your pooch has a 50 percent chance of looking like either parent or that he'll look like a combination of the two. In reality, though, his chances of resembling either of his parents may be higher or lower, depending on what genes each parent carries. When the genes of each of Fido's parents are combined, only certain ones determine his physical and behavioral traits. This is because some genes are dominant and others are recessive. Dominant genes always outrank recessive ones and decide which traits your pup will exhibit as part of his physical appearance, also known as his phenotype, according to the Australian Shepherd Health & Genetics Institute. Recessive genes usually remain hidden, unless combined with each other. These genes still become part of your pup's ultimate genetic makeup, known as his genotype, and are available to pass onto his offspring. For this reason, there are three possible combinations of genes, two dominant, two recessive or one dominant and one recessive. When two pooches, both with dominant genes, shown as "BB," mate, their offspring will have those genes and resemble them. The same is true if two pups have all recessive genes, shown as "bb." It's when pups with a combination of recessive and dominant genes, represented as "Bb," mate, that things get complicated. 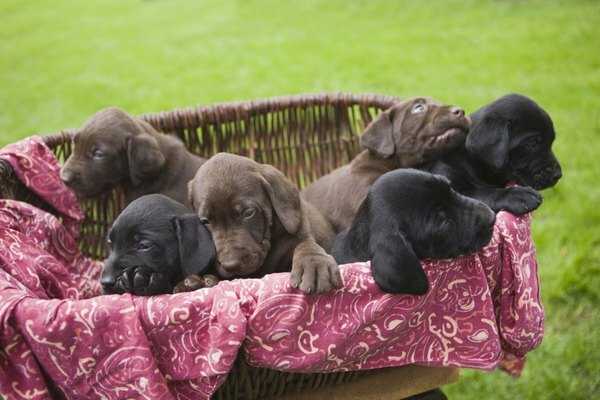 Their puppies have a 75 percent chance of resembling their parents. The pups have a 25 percent chance of resembling neither parent, if their hidden recessive genes combine into the "bb" configuration, according to the Gwinnett County Public Schools website. Of course, if one parent has dominant, "BB" genes, then the offspring will inherit that parent's traits, but if one has recessive, "bb" genes, there is a 50-50 chance they will resemble either mom or dad. The likelihood of your puppy resembling either of his parents depends on each of their genetic makeups, some of which may be hidden and unknown to you. Knowing the physical appearance and traits of their ancestors could be helpful in determining what he may look like as an adult, because it could reveal what hidden genes are lurking in his DNA. Pups who carry the genes for hereditary diseases or deformities shouldn't be bred because of the possibility that they can pass these conditions onto their offspring. These undesirable genes also could pop up in later generations as hidden recessive genes, warns the North Carolina Responsible Animal Owners Alliance. University of California, Berkeley: Do Progeny Inherit Traits From Their Parents in Predictable Ways?